The case for highly evoloved advanced technological civilizations billions of years older than Earth-based humans just grew stronger according to new research from the Niels Bohr Institute. All objects in the image are distant galaxies – not stars. Early galaxies from the infancy of the Universe more than 12 billion years ago evolved much more quickly than previously thought, new research shows. This means that already in the early history of the Universe, there was potential for planet formation and life. The image below is from the Nordic Optical Telescope of one of the quasars researchers have looked at. 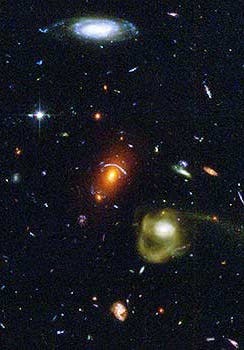 After having removed the quasar light from the image, the distant galaxy appears, which is indicated by an arrow in the image to the right. They discovered that the galaxies from the very early universe had a surprisingly large quantity of heavy elements. Credit: Nordic Optical Telescope. "We have studied 10 galaxies in the early Universe and analysed their light spectra. We are observing light from the galaxies that has been on a 10-12 billion year journey to Earth, so we see the galaxies as they were then. Our expectation was that they would be relatively primitive and poor in heavier elements, but we discovered somewhat to our surprise that the gas in some of the galaxies and thus the stars in them had a very high content of heavier elements. The gas was just as enriched as our own Sun," explains Professor Johan Fynbo from the Dark Cosmology Centre at the Niels Bohr Institute, University of Copenhagen. "There are some extreme objects in the Universe called quasars. Quasars are gigantic black holes that are active and when matter falls into them, they emit light that is as strong as thousands of galaxies. They are like a kind of lighthouse that lights up in the Universe and can be seen very far away," explains Jens-Kristian Krogager, PhD student at the Dark Cosmology Centre at the Niels Bohr Institute, University Copenhagen. He explains that in order to use quasars as light sources the quasar must lie behind the galaxy you want to observe. Astrophysicist Jens-Kristian Krogager explains about baby galaxies from the young universe more than 12 billion years ago evolved faster than previously thought. This means that already in the early history of the universe, there was potential for planet formation and life. "We then look at the light from the quasar and can see that some light is missing. The missing quasar light in the image has been absorbed by the chemical elements in the galaxy in front of it. By analysing the spectral lines we can see which elements there are and by measuring the strength of each line we can see the amount of the elements," explains Jens-Kristian Krogager. "For one of the galaxies, we observed the outer regions and here there was also a high element content. This suggests that large parts of the galaxy are enriched with a high content of heavier elements and that means that already in the early history of the Universe there was potential for planet formation and life," says Johan Fynbo.